We have no shortage of ideas for new medical devices. Many interventional vascular specialists have ideas for new devices or procedures, or ways to improve existing ones. There is no shortage of capital for good ideas, either. The weak link in the innovation cycle is the randomness underlying the process by which the ideas, management, prototyping, intellectual property, and other foundational components connect with each other at the early stage. If you are like many inventors, you do not have an experienced coach to manage the process. You have a daytime job, maybe a family, and the path forward is uncertain. You are vaguely aware that unless you get a lot of unfamiliar issues right, the odds are low that you can create a package that will attract the people and capital necessary to proceed. So, it comes as no surprise that although many physicians out in the field have clinically valuable inspirations within the scope of their expertise, only a few have a realistic way to connect the dots. The result is an unfortunate restraint on the pace of medical evolution. We lose ideas for the wrong reason, and promising therapies never reach the patient. We need to fix that. One of the most daunting of the early stage challenges is intellectual property (IP). Most people know that unless you get the IP right, the effort is either wounded or doomed to failure. But, at its core, there are only three fundamental issues that provide the structural framework for the byzantine statutory and jurisprudential rules that follow. If you want to succeed, it is valuable for you to understand that basic framework and consider involving experts to manage or help manage the complex details of the process. This article is part one of a series that will present the three big issues in IP: Do you own it? Can you protect it? Do you have the freedom to practice it? In this article, we set the context and explore common issues involving that first question: Do you own it? The law always provides a starting point, and then exceptions and qualifications. Regarding ownership, the starting point is that your invention belongs to you, unless you gave it away. Often, employees, faculty, consultants, or others give future inventions away in the form of an invention assignment clause in an employment, consulting, or other contract. I have worked with inventors who genuinely did not realize that the company or university would own their invention. They just sat down on the first day, maybe years ago, and signed a stack of papers so they could get the keys to their lab and start working. Like a mortgage, no one really reads the details. But you need to know this one, so pull out any agreements you have signed (or are planning to sign) with your employer or other party and see whether any of them contain an invention assignment clause or any other provision affecting ownership or use of your inventions. What if you can’t find your copy of the agreement(s)? Ask for it. Human resources and legal departments are generally quite skilled at retaining documents that might be helpful to them. Once you have these, you might find that some are quite clear and others are indecipherable. There is no single standard. Some agreements also try to incorporate external documents, such as a university’s policy manual on IP, which might be 300 pages long and may have been amended many times from the version that was in existence when you signed your agreement. Unless your agreement is quite clear, you may need legal counsel to understand it. Let’s assume your contract contains an invention assignment provision. The next issue involves the scope of the provision and whether it is likely that your next invention will belong to your employer. Here is a series of successively narrower hypothetical descriptions of subject matter that your agreement could purport to require you to assign to your employer: (1) all inventions you make, period; (2) all inventions you make using employer resources on employer time; (3) all inventions relating to the employer’s current and foreseeable business; (4) all endovascular inventions; (5) all endovascular inventions above the iliac bifurcation; (6) all neurovascular inventions; and (7) all inventions relating to drug delivery coatings for nitinol embolic coils for inhibiting hemorrhagic stroke. Some of these provisions could be unenforceable, as they are excessively broad; some could seem unfair but be enforceable because you signed the agreement. You may be able to negotiate the scope of the obligation, within reasonable limits. Repeat inventors or key opinion leaders sometimes have sufficient bargaining power and can negotiate very narrowly tailored assignment obligations, enabling them to consult with other people or organizations on related, but not identical, technology. Another agreement consideration is whether you should carve out any inventions you made before signing the agreement. Suppose you had an idea that you want to pursue but have not yet been able to make the effort. If you then sign an invention assignment agreement with an institution and later pick the preexisting project back up, the institution may understandably believe that you invented that device during your employment, and as a result, it should own the invention. You can seek to write a carve-out into your agreement that identifies the previous invention in sufficient particularity, but without revealing the details. That elevates certainty, eliminates surprise, and protects your ownership. You can also seek a carve-out in advance for subject matter in which you might want to invent in the future, if you want certainty that you will own it if you do. Sometimes, the scope of the assignment obligation is unclear, it is too late to renegotiate it, and there is a legitimate issue as to whether your invention falls within the obligation. One course is to approach the institution and seek a written release or acknowledgement that the institution makes no ownership claim to that particular invention. You may have some reluctance to take this approach, and in some instances, it may be better to do this through counsel. But if the issue of ownership is cloudy, you will likely find it difficult to raise capital or later sell the technology. If you do decide to seek a release, earlier is better. Do not wait until you have proved value or until you are walking into a financing meeting. Let’s assume you start out owning the clear title to the invention. Another set of ownership-related concerns can arise if you disclose the invention to third parties. The paradigm is common: you think you have a way to stop endoleaks in abdominal aortic aneurysm grafts, or perivalvular leaks in a transcatheter aortic valve replacement procedure, or something of similar clinical interest. A couple of obvious business partners are already out there, so you want to license the technology to one of them, rather than try to start your own company. The natural tension is that you do not want to disclose too much because of the concern that the other party might take the idea and run, yet the other party genuinely needs to understand sufficient detail to evaluate the desirability and value of a deal. If you disclose it without a confidentiality agreement, sometimes called a nondisclosure agreement, you probably gave it away. At the same time, you irrevocably lost patent rights, unless you have already filed a patent application. The scope of that loss varies in different countries, which is beyond the reach of the present article. The bottom line is: do not disclose the invention details without a confidentiality agreement in place. Often, the other party will offer to let you use their standard confidentiality agreement. This is nice of them, but make sure you review it as carefully as you review your employment agreement. These agreements can easily include provisions that you would not want to have, leave ambiguity in areas of importance to you, or omit provisions that you would like to have. Quite often, the prudent course would be to consult with counsel on issues raised by the agreement. 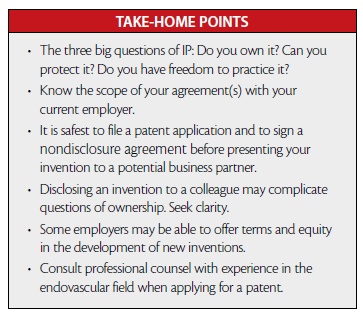 Even with a confidentiality agreement in place, you take a variety of business risks if you have not filed a patent application before disclosure to a potential partner. The safest course is to file the patent application first. The considerations involved in that process are also beyond the reach of the present article, but in most cases, until you have considerable experience, you should consult counsel with specific experience in the endovascular field, rather than trying to do that on your own. Another type of disclosure that can affect ownership is a disclosure to a colleague. Assume that you have an insight for an invention. A friend or coworker enters the room, and in the excitement or in seeking validation, you describe the idea. An impromptu brainstorming session follows, and the idea begins to take a more defined form. Inadvertently, you may have perfectly positioned your colleague to become a coinventor on at least some aspect of the technology. That happens frequently at the start of a new project or company. Often, the coinventors proceed to decide what business relationship (eg, prefinancing percent equity) seems fair, have some agreements drafted, and move forward in concert, but this does not always have a happy ending. Your best friend might have the exact obligation to assign to his or her employer that you negotiated out of your employment agreement. Now you are right back in some form of a partnership with someone’s employer because of your coinventor’s obligation to assign his or her interest in the invention. This issue is complex, and the solution, if there is one, will always require involvement of counsel. The best course is to avoid it at the front end by preventing the creation of coinventors until you are comfortable that you understand where that is likely to lead. This article leads with the premise that complete ownership of your inventions is the goal. This is often but not always the case. For example, if you were hired to invent stent wall patterns, you should probably expect that assigning them to the employer was a part of the deal. New companies and deals are not an option. Also, a growing number of institutions are implementing acceptable, and possibly even generous, terms that allow the inventor to share in the equity of a new company that might arise from technology assigned to the institution. Some institutions will be in a far better position than you will be to advance the technology in the direction of the marketplace in terms of both human and financial resources, and while that is happening, you get to stay focused on your daytime job. Assume that your invention falls in a gray zone, such that you might be able to obtain a release from your employer if you push for it. Consider carefully the two paths of (1) going it on your own or (2) taking whatever package your employer may offer before spending energy seeking to perfect your title. As you start thinking about how to proceed with your invention, consider whether you really have the time and expertise to develop the technology. Also consider whether you are prepared to surrender the equity and control necessary to attract the right teams or to run it through the institutional process. The path you choose could affect the manner and extent to which you seek to perfect the title to your inventions. The content of this article is provided for informational purposes only, is not legal advice, and is not intended to be a substitute for professional legal counsel. Gerard von Hoffmann, JD, is a partner in the Silicon Valley and Orange County offices of Knobbe Martens, LLP, an IP law firm with extensive experience in patent strategy and litigation in the medical device industry. Mr. von Hoffmann may be reached at gvh@kmob.com. See also www. knobbe.com and www.knobbemedical.com for resources and information for the medical device entrepreneur. Technical tips and considerations that I have learned during my years of utilizing this approach. Percutaneous and surgical access and the available vascular closure devices for treating this often-challenging vascular anatomy. This technique can be applied in a majority of AAA patients.